There was a sizable collection of telegrams and letters my grandfather sent my grandmother in the 1930s and 1940s. I found high school and college transcripts for my grandmother. 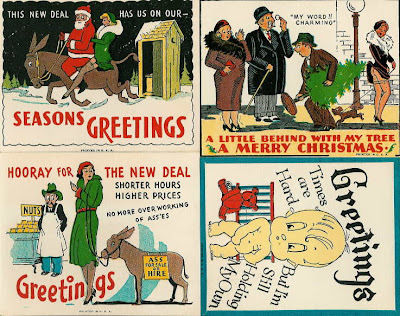 There was also a handful of unused humorous holiday postcards. The references to the New Deal suggest they were either purchased or received by my grandmother in the early 1930s. 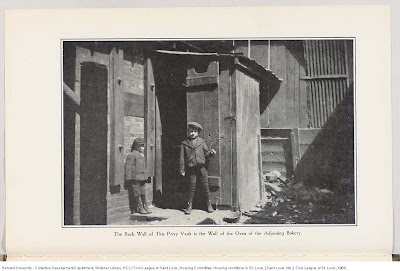 Caption: "The back wall of this privy vault is the wall of the oven of the adjoining bakery." 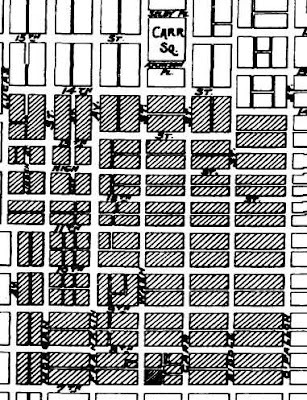 Source: Housing Conditions in St. Louis: Report of the Housing Committee of the Civic League of St. Louis, The Civic League of St. Louis, 1908, p. 22. Kathi mentioned that Footnote was opening its database of FBI files to free access until the end of August. So I headed on over to see what I could find. I soon learned that Uncle Sam had a 3-page file on my "Uncle Sam". Sam was my maternal grandmother's brother. As I've written before, he had a son named Everett born in 1906, who drowned in 1924 at age 17. He was also possibly married for a brief time to Everett's mother, but was single in the 1910 and 1920 California censuses, while Everett and his mother were in the Austin Texas censuses. In 1930 Sam was living in Kansas City, Missouri, where he died in 1933. Page 2 of the FBI file an investigator writes that he visited "the Van Every ranch" but no one was home. He describes the ranch as 3-4 miles south of Fabens, Texas. 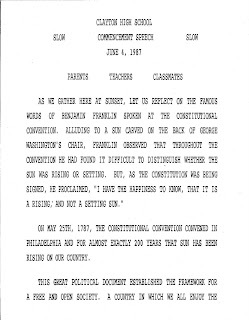 On page 1 there is a statement from Samuel’s mother, Margaret Jane Van Every, my great-grandmother. My name is Mrs. M.J. Van Every, my son SO Van Every was born January 15th, 1886, near San Marcus Texas, and is now 32 years of age. Mrs. Van Every then presented the family Bible with record of births that had been kept by her for many years, and this record shows that on January 15, 1886 a son was born and that his name is Samuel Opham Van Every, the record of this Bible has not been interfered with since the birth of this subject was recorded therein as it is in perfect condition and shows plainly that there has been no erasures of any nature. Closed?! The investigation has just been re-opened! It appears there was definitely a woman very upset with my great-uncle who tried to attack him with anything she could think of (bigamy, draft evasion and pro-German sympathies.) How much of it was true? Anything? And dangit, why does she have to go by the name “Mrs. SO Van Every.” So dang unhelpful! Of course, she gives a date for her alleged marriage. Unfortunately, my quick research turns up that Florida state records only go back to 1927, and I have been unable to find information so far on how to obtain Jacksonville (Duval County) marriage records. The county website only mentions birth and death records, so it is possible the marriage records aren't available. Though I've just begun to look. From my grandmother's collection I have a photocopy of what most likely is the family record that appeared in the family Bible, and was shown to the agent. I've figured it was the type of record one would see in the front of a Bible, but wasn't certain of its origin. It's wonderful to see a reference to it. This also illustrates that you don't need to actually do anything to have an FBI file - it's possible to get an FBI file if you anger someone enough that they write to the government and make claims against you the FBI needs to investigate. The claims may be true; they might not be true. But it's worth searching the database, as even the simplest of investigations might include facts about your relatives you didn't know. This is a very commend request we as that you provide some type of documentation. 1) Universities maintain historical records of students, and you can find the contact information for the Office of Student Records (or equivalent) on the university website. Sometimes when researching, you have to punt. I am very appreciative of the flexibility of Ancestry's search engine. 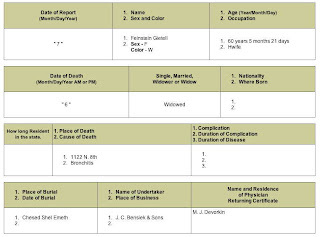 On many databases, the surname field is required, but not at Ancestry. You can search for everyone named "John" across all their databases. The over 45 million results in their census databases alone probably isn't very useful, unless you were curious about the popularity of the name. I remember last year I was searching for descendants of my great great grandfather, Selig Dudelsack's brother, Julius. 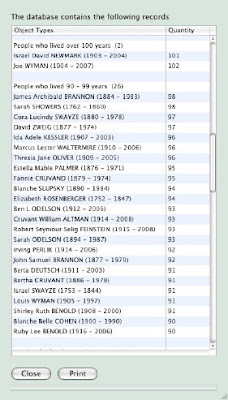 I found Julius (who had changed his surname to Odelsohn) in the 1900 St. Louis census, and his oldest daughter was named Pearl. Pearl wasn't in the Odelsohn household in 1910. From her age in 1900 I knew the odds were that she had gotten married - but I had no clue who to. So today my mother gave me an assignment. She wanted to know where the two children of one of her cousins were. I had their full names from the Texas Birth Index. The son was easy to find - alas, in the Social Security Death Index. The daughter was more difficult, as daughters often are. And since she was born in 1940, there were no censuses to search. But Ancestry does have a Public Records Index, and many of the entries have ages associated with them. So I punted. That's all I gave it. Only 1 result in the Public Records Index. In the same town her mother died, and 30 miles from where her brother died. (Individually the first and middle names are fairly common, but not too many people use both.) Is it her? If you are not ____(maiden name)____ I apologize for the inconvenience, and please discard this letter. The 52nd edition of the Carnival of Genealogy has been posted at 100 Years in America. If I counted correctly, there are 29 wonderful posts on the theme of age. The next edition of the Carnival of Genealogy will be a “carousel” edition. Just as carousels have a variety of animal figures so, too, will the next edition of the COG have a variety of topics. All subjects are welcome but please limit yourself to one submission. Submit any article you’d like (genealogy-related of course!) and if you'd like an introduction for it, please write your own. 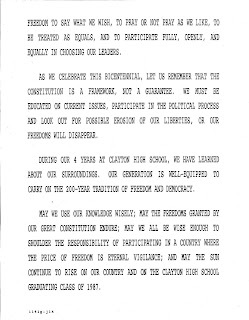 can be found in the National Archives' Archival Research Catalog and will be part of its contribution to the World Digital Library. 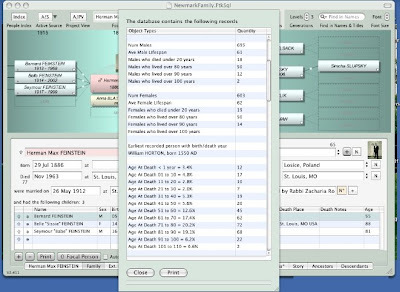 Randy Seaver at Geneamusings has been asking whether various genealogy software can display a list/report of selected people and their ages at death, or at least the top 20 in descending order. I suggested the modification to the report in their forums, and within 2.5 hours, the modification had been made. (As someone with programming experience, I had a suspicion my request was on the simpler side of some requests that get made in the forums, but I was still impressed.) I requested the new version, which was 2.411, so I was able to see it in action. Here are some screenshots to go along with the instructions I gave Randy in his comments. Step 1: From the 'Reports' drop-down menu, select 'Statistics'. 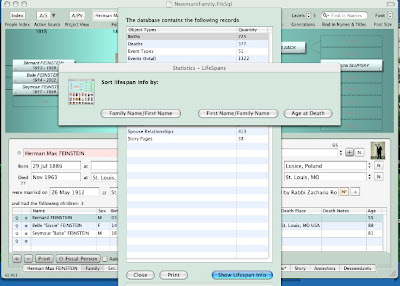 Step 2: A window will open with some general information on the number of births, deaths, marriage, pictures, sources, and a few other types of records. At the bottom of the window, click on 'Show Lifespan Info'. Another window will open providing you with a choice of three sorts: 1) Family name, First name; First name, Family name; Age at Death. I selected the last. As you can see we start off with some overall statistics. Age At Death < year =" %"
Age At Death 1 to 10 = "%"
11 to 20 = "%"
21 to 30 = "%"
31 to 40 = "%"
41 to 50 =" %"
51 to 60 =" %"
61 to 70 =" %"
71 to 80 =" %"
81 to 90 =" %"
91 to 100 =" %"
101 to 110 =" %"
You could scroll down further and see the complete list of those who died from 80-89. You will notice that you have the option to either close the window, if you are happy just viewing it, or print it. It 'prints' to an .rtf file, and it opens in TextEdit. How can I ever repay? They were designed for chemists. The National Archives recommends using them to remove staples and other fasteners. Librarians and Bookbinders find them useful as well. I'm thankful to Sally Jacobs, The Practical Archivist, for suggesting their usage in extricating photographs from sticky photo albums. 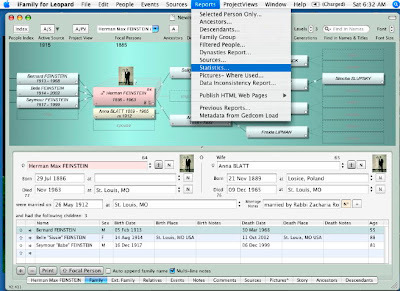 Steve Morse on his website has added a Cook County One-Step for searching Cook County's new Vital Records. There are two big improvements in his search script over Cook County's. Instead of computing the soundex code, you can select 'sounds like', and his code will compute it for you. Also, if the search results contain a marriage record, there will be a link to click on for the spouse. All My Branches Genealogy mentions MissouriCaseNet's Your Missouri Courts, where you can search court records throughout the State of Missouri. I found cases that went back to the 1970s, though it feels strange looking through the pages of results. There are a handful of cases I might consider notable in my research. For example, there were a few divorces, and I could write down a date. However, I'm not interested in knowing which of my cousins had state traffic tickets, or which of my cousins was a repeat DWI offender. (More than not being interested, I'm not sure I wanted to know.) There were also personal injury suits that were filed that I don't find exciting, either. Though part of my lack of excitement probably stems from the fact they don't provide the details, just the names of the parties, the type of charges, and the outcome. Another reason for my lack of excitement is that they are all rather recent activities. I either know these people well, or they are distant cousins. However, there is the possibility if you have relatives in Missouri you will find out something about them in this database. This is the fourth in a series of Brick Wall posts. Samuel Joseph Newmark was born in Warka, Warsaw, Poland on Oct 7, 1863. He married Rose Cantkert. (That's the best guess at the spelling of the name that was written down on the birth certificates of three of her children as Sandgart, Sonka, and Sankad. It is my understanding that the 'C' in Polish is pronounced 'Ts'.) Rose was born in approximately 1865. In 1893 they immigrated from Poland to England with sons Sol, Barnet, and Max, and daughters Nellie and Bella. In London they had three more children - Kate, Cecile, and Israel David. In two voyages in 1908 and 1909 the family immigrated from England to the US, settling in St. Louis. Samuel, and most of his sons, were tailors. We know that Samuel's father's name was Israel David. We think his wife's name was Leah. Samuel almost certainly had siblings, but nothing is known about them. The photograph in this post was discovered today in a photo album. It was taken in 1938. It is filled with entries about men and women who have or had an Independent Spirit. The 52nd Edition of the Carnival of Genealogy will focus on the simple topic of AGE. With the understanding that "age is often a state of mind", share your family story about someone whose story stands out because of their age, either young or old. Inspired by a comment in the prior post, here's a list of Vital Records and related databases/indexes I know about for the state of Missouri. If anyone knows of any others, mention them in the comments. St. Louis Public Library: Obituary Search, St. Louis Post Dispatch Obituary Index(1880-1926,1942-1945,1992-2006) and St. Louis Argus Obituary Index (1915-1927,1942-1945) [the search link is in the process of combining the information in the two indexes] This provides date and page number, but saves a lot of time if you have access to the microfilm. This is the third in a series of “Brick Wall” posts. I have actually discovered a few leads in the past couple days on this branch of the family which provide a little more hope than previously. Samuel Deutsch (1861-1938), his wife Helen Lichtman Deutsch (1881-1958), and six children (Jean, Edward, Maurice, Ted, Martin, and Berta) immigrated to America in 1913 from Nagayalmas, Hungary. The town, in the Transylvania region, is now part of Romania. (Helen actually arrived a year earlier to earn money for the rest of the family to make the trip.) In 1914 a 7th child, Allen, was born. They all settled in Chicago, Illinois. According to family records, Samuel’s parents were Abraham Deutsch and Sarah Weiss. I have no information on them except for their names. Martin, Ted and Berta recorded a family history audiotape in the 1970s, and they knew their father had had several siblings, and they had cousins in America, but they hadn't seen them in years and their memories were hazy. They were able to come up with a handful of names, though their certainty was low. They also knew that Samuel had had a wife prior to Helen in Hungary, and six children who decided not to come to America. They didn't know any names. David Deutsch – it is thought he was in America only briefly and returned to Hungary. 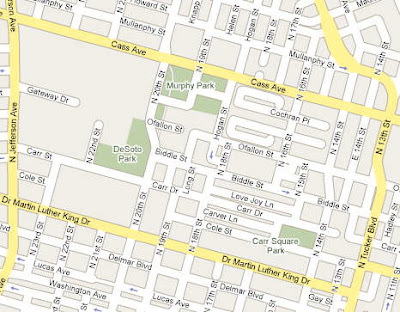 However, a son of his, Herman, settled in Michigan, was a teacher, and he changed his name to Herman Dexter. It’s not believed he had any children. David may have had a few daughters who stayed in America, and their names may have been Hannah Goodman, Celia Palmer and Bertha Newman. Sarah Deutsch – married a Rosenblum, and had six children. One son named Daniel, and five daughters. 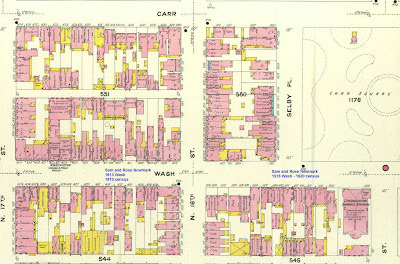 I found a Nathan and Regina Greenfield in the 1930 Chicago census, with children Gertie, Milton and Irving. Country of origin being Hungary. I found in Chicago a Joe and Eva Deutsch with sons Sigmund and Albert, living on the same street as Samuel and Helen in 1920. There are enough names here I should be able to locate some cousins with a little help from the Chicago Vital Records which are supposed to come online at some point in the near future. Before then I might make a trip to the local library and browse through the Chicago city directories for 1923 and 1928, but I'm not sure if they will provide more information than the census already does. Unfortunately, after 1928, the next Chicago city directory at my local library is from 1973.